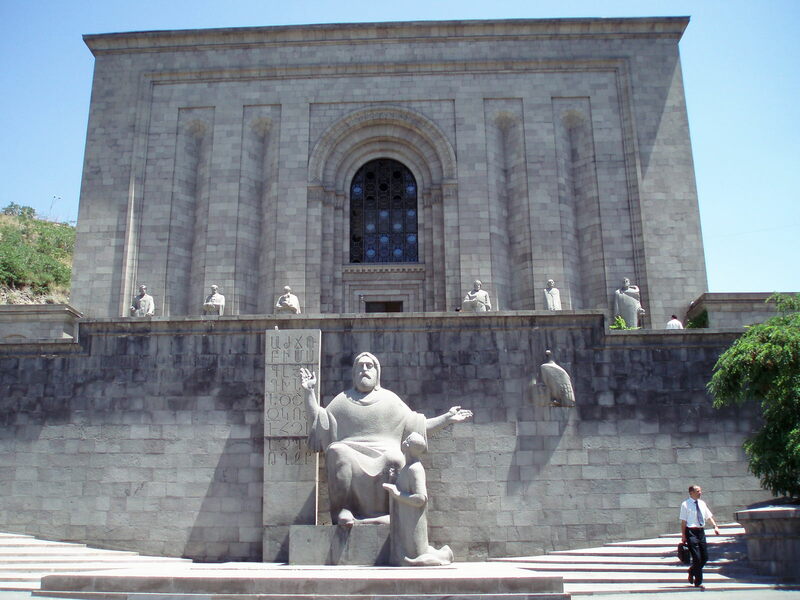 A review of the Matenadaran Institute Library, Yerevan, Armenia. Presiding over Mashtots Avenue, Yerevan’s central boulevard and one of its largest, is a square building of dark basalt, rising high above the street level and inviting the reverent gaze of a casual passer-by with its imposing frame. Where the asphalt of the avenue ends, a slope of cobblestone leads you up a steep hill, up several flights of stairs, and up a serpentine walkway that deposits you, now panting, in the small plaza in front of the solemn entrance of Matenadaran. Named for the Old Armenian word for “Depository of Books,” this building houses more than 10,000 ancient Armenian manuscripts and employs several dozen full-time researchers. All or most of these manuscripts are carefully catalogued, and many are studied by scholars of things Armenian worldwide. For me as an Islamicist, however, this Institute has always been attractive for its lesser-known treasures. Its nearly 2,500 Islamic manuscripts in Arabic, Persian, and Ottoman Turkish ­­– numerous enough to merit a separate building – lie comparatively neglected. They do have a catalogue, to be sure, but a handwritten one made in the 1940s that is incomplete and difficult to use. But there is good news: an edition of the Persian documents of the collection was published some decades ago, and a catalogue of its nearly 500 Persian manuscripts is currently being compiled. I cannot speak of Matenadaran’s some 300 Ottoman Turkish manuscripts, but I have personally worked with several of its Arabic ones. They run the full gamut of the classical Islamic written tradition, including works on grammar, philosophy, and history, as well dream manuals and works on magic and other assorted sciences. The collection preserves a letter attributed to the Prophet Muḥammad enjoining the good treatment of his Christian subjects (with a counterpart in Persian attributed to his nephew ‘Alī that enjoins the good treatment of his Armenian subjects). And along with several beautifully ornamented copies of the Qur’an, the collection boasts a multivolume copy of Ghazālī’s Iḥyā’ ‘ulūm al-dīn. Once you are past the arduous labor of finding the manuscript you need and about to embark on the sweet labor of studying it, you will find the working conditions inviting and pleasant. If the work you request is already digitized, you are escorted to a special computer in the main reading room where the scanned images are uploaded for you. Complete with an entire wall of reference works and overseen by portraits of stern-looking sages of the past, it is a peaceful place with huge windows gazing into the distant downtown. (When I last worked there in 2004, there were four rows of wooden desks, each covered with nice green fabric.) If a manuscript is not yet digitized, they will digitize it for you within five days. And no, you cannot copy these directly and take them home, but you may order personal copies at the somewhat steep price of the equivalent of $2.50 per folio image. For a much more reasonable price, you can also take a break and have a snack in the cozy dining hall, which features hot food and beverages for all visitors; a cup of tea runs a mere 25 cents. 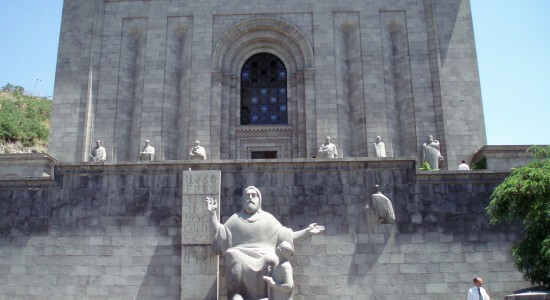 And if you cannot bear to tear yourself away from the manuscripts, Matenadaran stays open, five days a week (Tuesday-Saturday), from 10:00 am to 9:00 pm, far past the closing time of many a manuscript library in the rest of the world! Image: Enluminure arménienne, fr.academic. ru.